Ever thought about how the fuel in your vehicle’s tank is fed to the engine? It’s a very interesting process, actually, and it’s usually handled by the fuel pressure regulator. This part of your vehicle utilizes pressure to inject fuel into the engine. If it uses a single-point injection, then the pressure is maintained at around 15 psi, but if the injection is multipoint, then you’re dealing with around 45 to 50 psi. Builds up excess pressure, hence delivering too much fuel to the engine, and leading to a rich mixture. It’s unable to hold adequate pressure, thus providing too little fuel, and leading to a lean mixture. When you’re confronted with these conditions, then the fuel pressure regulator (FPR) probably has a leaking diaphragm, a worn-out valve or spring or perhaps the vacuum is broken. If you’re dealing with hard starting, stalling and hesitation or misfiring, then you know there’s possibly a problem with the FPR. But, these symptoms could also be caused by other problems such as a failed fuel pump or an issue with the automatic transmission. That’s where further troubleshooting comes into play. This article outlines a few tests that you can do immediately to figure out if your fuel pressure regulator is malfunctioning. You will need a fuel pressure gauge for the exercise, so be sure to have that on hand. Don’t have the tool? Purchase one online; it’s fairly inexpensive. We recommend that you check for leaks right after taking your car for a ride, as that will help reveal leaks. The FPR is a little metal cylinder that has a slender vacuum hose attached on the upper side. When you open the hood, follow the fuel rail (the component supporting the fuel injectors). You should find the FPR on one of the rail’s ends. You might also spot a fuel inlet and a fuel outlet attached to the FPR, depending on how it is designed. Realize that on newer car models, the manufacturers are placing the FPR in the fuel tank as part of the pump, and thus you will likely not find it. On such models, computers are used in the maintenance of pressure. Check to ensure that the vacuum hose is connected tightly, keeping in mind that if the connection is loose, then the FPR won’t work as expected. Investigate the hose for wear and tear and detach the vacuum line from the FPR. After detaching the vacuum line, can you see signs of fuel in there? If so, then there are leaks in the regulator’s diaphragm, and that will need you to replace the regulator. If there are no signs of a leak, then go on with the test. Also known as the Schrader valve, the test valve is situated on the fuel rail on most modern vehicles, and it looks like the valve on the tires. So, you’re using an old car model, and you can’t see the test valve? Go through your repair manual for how to connect the pressure gauge. Tip: in case you cannot find a test port on the test valve or the adapter you have isn’t suitable, detach the valve and attach the pressure gauge directly. You could also try disconnecting the fuel inlet and connect a T-adapter, then attach the pressure gauge and the fuel inlet to the T-adapter. Go through your repair manual for the correct fuel system specification on pressure readings when the engine runs and when it’s off. Start the engine and observe the pressure reading as the engine runs. Note: if you remove the vacuum line while the engine runs, the pressure reading should go up; if it doesn’t, then the FPR has a problem. Then, turn off the engine and observe the reading with the engine turned off. In the event that the pressure reading as the engine runs is lower than it should be (according to the manual), check the fuel pump, the anti-drain valve, and the fuel filter. Maybe the fuel pump is not pumping adequately, and that’s what’s causing the pressure not to build up or to go down. The anti-drain valve could also be the issue; maybe it’s defective, causing the fuel to drain back to the tank. Or, the fuel filter is clogged. All these are possibilities you should consider before assuming the problem is with the FPR. When you shut the engine, did the pressure start dropping almost immediately? Then the issue may be a leaking anti-drain valve or a leaking injector, or the FPR might indeed be damaged. Haven’t changed the fuel filter for over a year (or the duration your manual recommends)? Then try doing that now and perform the test once more. You might be surprised to see the pressure going back to normal. In case after replacing the fuel filter the pressure reading is still low or goes down soon after turning off the engine, then it’s time to test for maximum pressure. Note: if your vacuum line is working properly, and it’s in good condition, but the pressure reading is higher than normal, then, most probably, your fuel pressure regulator has a problem. This test should be done if the previous test revealed a low-pressure reading once the engine was shut. As long as the fuel filter is in good shape, this test will help pinpoint the point of failure. Attach the gauge correctly as described in the previous step. Get two cloths. Place one over the fuel inlet hose and the other on the fuel outlet hose. Need help locating these hoses? Use the repair manual. Start the engine. Let it run for two minutes, and then switch it off. Immediately after turning off the engine, block the inlet and outlet fuel hoses using a pair of pliers (vise grip or slip joint will do). You might be wondering why we said you should place cloths over the hoses. Well, it’s for preventing the pliers from damaging the hoses. Observe the reading on the gauge for a few moments. Is the pressure stable? Then the problem might be in the anti-drain valve. Does the pressure drop? The problem is either in the FPR, or a leaking fuel injector. 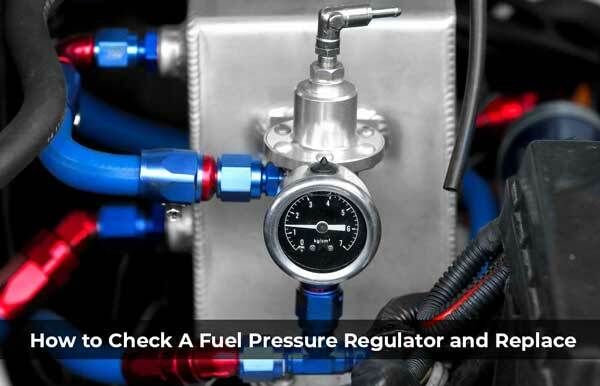 Before you replace the FPR, you need to relieve the fuel system of pressure. Realize that in some fuel systems, the pressure can go as high as 60 psi, meaning that if you try working on the fuel system before relieving the pressure, the fuel can be discharged abruptly with lots of force, and if it lands on your eyes, there’s sure to be a disaster. Your repair manual should have a guide for bleeding that particular fuel system of pressure. Watch this video to know more details. Purchase an FPR for your specific fuel system. Relieve the system of pressure. Detach the negative battery terminal. Detach the hoses attached to the FPR. Unscrew the nuts that hold the FPR to the injector rail and remove the FPR. Compare the new FPR with the old one. Are they alike? Great. Lubricate the O-ring then install the FPR where the old FPR was attached. Be sure to tighten the nuts securely. Reinstall the hoses and ensure the connection is tight as it was on the old FPR. Use the pressure gauge to take the readings and verify they’re in line with the specifications on your service manual. Do they match up? Great! The installation was a success. 1. What symptoms tell me that my fuel pressure regulator is faulty? The most common symptoms include stalling, blackened spark plugs, black smoke from the tailpipe, gas dripping from the tailpipe, gas odor, and gas in the vacuum hose. 2. Can a faulty FPR cause reduced gas mileage? Yes. The fuel system is composed of various parts, and if any of these parts fail, the car might run unsteadily or even fail to run at all. Particularly when the fuel pressure regulator is defective, the mileage might go down drastically. 3. What does it mean that my car has a misfire? Engine misfire refers to the engine skipping over one of the combustion cycle processes. The issue can lead to the engine running rough, bucking or jerking. Generally, an engine misfire causes the engine to be inefficient. When your FPR fails, the engine might experience misfires. There are a plethora of other causes of an engine misfire, including dirt in the fuel injectors, a faulty fuel pump, worn out spark plugs, and bad plug wires. As you have probably discovered, testing a fuel pressure regulator (FPR) is a no-brainer exercise. Installing a new one in case the existing one is bad is also not very difficult. Actually, the entire exercise shouldn’t take more than an hour. Remember to have the tools needed for the job – a fuel pressure gauge and slip-joint pliers. With those, the task will be easy. Something else you should remember is that if you’re seeing the signs of a defective fuel pressure regulator, it doesn’t have to mean that the regulator is bad. Perhaps the fuel filter is clogged and needs replacement. If the vehicle is stalling, maybe you’re releasing the clutch too soon or changing the gears incorrectly. These are all considerations you ought to make before changing the FPR. Did you find this article helpful? Why not share it with your friends on the internet?